[Thanks to COMBO member Michael St. James for passing this report along!] 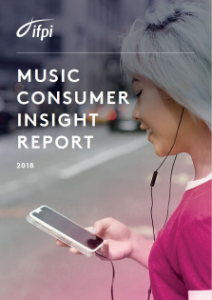 IFPI has today released its Music Consumer Insight Report 2018. The report examines the ways in which music consumers aged 16-64 engage with recorded music across 20 of the world’s largest music markets. ● Streaming is virtually ubiquitous: 86% of us listen to music through on-demand streaming. Young music consumers are most engaged streamers, with 57% of 16-24 year olds using a paid audio streaming service. ● Consumers are engaging with their local music genres: Music consumers especially enjoy listening to local music genres, with 66% of consumers in Japan listening to J-Pop, 69% of consumers in France listening to Variété Française and, in Brazil, 55% listening to música popular brasileira. ● High-growth music markets are seeing high levels of licensed engagement: 96% of consumers in China and 96% in India listen to licensed music. ● User upload services continue to dominate consumption: Nearly half of all time spent listening to on-demand music is on YouTube. ● Copyright infringement remains a significant issue: More than one-third (38%) of consumers obtain music through infringing methods – with stream ripping the dominant method (32% of consumers). IFPI commissioned AudienceNet to carry out the fieldwork for global research which explores the way consumers engage and access music across licensed and unlicensed services. The research was conducted amongst a demographically representative sample of the online population aged 16-64 in the following eighteen territories: Argentina, Australia, Brazil, Canada, France, Germany, Italy, Japan, Mexico, Netherlands, Poland, Russia, South Africa, South Korea, Spain, Sweden, United Kingdom, and United States. In addition, the study was also conducted in China and India but results from these two countries are not included in “global” figures within the report. Y’all, this IFPI report just proves I am right. Highlight: only 27% of global music listeners between 16-64 pay for music streaming. 20% use it ad-based/free. It’s not catching on like we have been sold. 52% of all music listening is happening on video streaming. 47% of it on YouTube. Response from Michael St. James: Dig these radio stats Chris: 86% of consumers listen to music on the radio | 25% of overall listening time is on radio and 4.4 hours are spent listening to radio each week globally.